GM's deadline to make a final decision on Saab's future is December 31. STOCKHOLM -- Unions at Saab, which is unable to pay wages to its workers, threatened on Thursday to start a legal process that could end in bankruptcy for the iconic brand. The IF Metall and Unionen groups said they would send a formal demand for payment on Monday if their members had not received their wages. "Then the company has seven days to react," IF Metall representative Veli-Pekka Saikkala told Reuters. "After that there are two alternatives. Either we see that the situation can be solved, or we demand that Saab is put into bankruptcy." Earlier on Thursday, Saab said it could not pay wages to its employees because it had not yet obtained necessary short-term funding. Saab's owner, Swedish Automobile NV, formerly known as Spyker Cars NV, and Saab are still in discussions with various parties to obtain short-term funding, including the potential proceeds from a sale and lease-back of Saab's real estate, it said. Saab spokeswoman Gunilla Gustavs said it is not possible to say when salaries will be paid. "That depends on when and if we can secure short-term funding, for example through the real estate deal," Gustavs said. "This is really bad news and we are working intensely to do something about it. There are no guarantees but we are not giving up." Swedish Automobile this month agreed on a rescue package for Saab from two Chinese car companies, Zhejiang Youngman Lotus Automobile Co. and Pang Da Automobile Trade Co. that it says would solve longer-term financing problems if approved by authorities in China and Europe. Analyst Martin Crum at Dutch broker AEK said a bankruptcy was still possible for Saab. "The company is in a downward spiral. The longer it takes, the tougher it gets. The longer it takes, the more potential buyers will leave," he said. Saab's Trollhattan factory in southern Sweden has been idle for at least two more weeks while the company talks with its suppliers. Saab has been forced to halt production at Trollhatten because of the cash shortage. Earlier this week the automaker asked its suppliers to accept 10 percent of what they're owed now and the rest in September, the chairman of Swedish auto-supplier association FKG told Bloomberg. Saab's letter to its approximately 800 suppliers also proposed that the carmaker pays them "cash on delivery" for future shipments, about five to six days after components arrive at the factory. Saab first halted production in April amid a payment dispute with suppliers. It restarted assembly May 27 after getting a cash advance from Pang Da, only to put the brakes on manufacturing again on June 8. Saab, which General Motors Co. sold in February 2010 to Spyker Cars NV, ran into a cash shortage after missing sales targets. 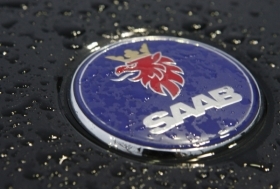 Saab is estimated to owe at least 300 million kronor ($47 million) to Swedish suppliers.